411 Freebies And More: Sign Up for Free Purex Products with Coupons!!! Sign Up for Free Purex Products with Coupons!!! 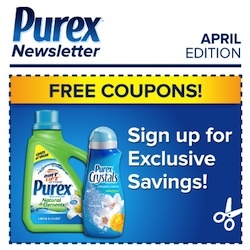 In April, Purex will be releasing not just one but TWO exclusive coupons to our e-newsletter subscribers. In order to have access to these digital coupons, consumers not already signed up for the Purex e-Newsletter must opt-in by next Friday, March 29.